In the game of chess, the pawns are the weakest pieces on the board. A pawn that can make it to the opposite of the board can be promoted to a piece of choice, usually a queen. Using promotion of pawns, it is possible for a player to have two or more queens on the board at one time. However, standard chess sets come with only one queen per side, so a captured rook is often used as the second queen by placing it on the board upside down. The city of Columbus, Ohio is a “purpose-built” state capital. The state legislature selected the location for Ohio’s new capital in 1812, choosing dense forestland with no significant settlement, largely due to its strategic location in the center of the state. The name was chosen in honor of the explorer Christopher Columbus. “Fahrenheit 451” is a 1953 novel by Ray Bradbury that tells the story of a future American society that discourages reading of books. The main character’s job is that of a “fireman”, someone responsible for burning books. The title was chosen to supposedly represent the temperature at which book paper will burn, although whether that temperature is accurate or not seems to be up for debate. Scalping of tickets, selling them above retail price for an excessive profit, originated in the mid-1800s with scalpers making money off theater tickets. There was also quite a bit of money made by people scalping railway tickets. Railroads gave discounts on tickets for longer journeys, so someone trying to get from San Francisco to Chicago say, might buy a ticket to New York. Once in Chicago the passenger would scalp the remainder of his/her ticket to someone wanting to get to New York, and make his or her invested money back with a bonus. The exact etymology of the term “scalper” seems unclear. The Corn Belt (sometimes “Grain Belt”) is a region in the Midwest where, since the mid-1800s, corn has been the major crop. Geographically, the Corn Belt covers Iowa, Illinois, Indiana and parts of Michigan, Ohio, Nebraska, Kansas, Minnesota and Missouri. About 40% of the world’s corn production comes from the region, and most of that production is used for the feeding of livestock. 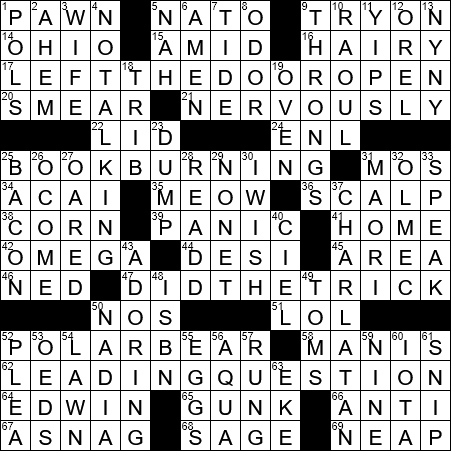 To find this website’s home page, just click on the LAXCrossword.com title at the top of each page. Polar bears are close cousins of brown bears, and are thought to have evolved from a population of brown bears that became isolated during a period of glaciation. Most polar bears live north of the Arctic Circle, and live mainly on seals that they capture near to the edge of ice floes. “The Mystery of Edwin Drood” is an unfinished novel by Charles Dickens. The story itself is centered not on the title character, but on Edwin Drood’s uncle, a choirmaster named John Jasper. “Gunk” is a thick greasy substance. The original “Gunk” was a brand of thick liquid soap that was patented in 1932. “Diaper” is another word that I had to learn when I moved to America. What are called “diapers” over here, we call “nappies” back in Ireland. The term “diaper” is actually the original term that was used in England for the garment, where “diaper” referred to the cloth that was used. The term diaper was brought to the New World where it stuck. Back in Britain, diaper was displaced by the word “nappy”, a diminutive of “napkin”. Something dilapidated has fallen into a state of ruin, a state of decay. Ultimately, the term “dilapidation” comes from the Latin “lapis” meaning “stone”, with the Latin verb “dilapidare” meaning “to throw away, squander”, literally “pelt with stones”. The Olmec were an ancient civilization that lived in the lowlands of south-central Mexico from about 1500 BC to about 400 BC. Mesoamerica is a region extending from Central Mexico, south to Costa Rica. It is known as an area where societies flourished prior to the Spanish colonization of the Americas in the 16th and 17th centuries. A charlatan is someone who makes false claims of skill or knowledge. “Charlatan” is a word we imported from French, although the original derivation is the Italian “ciarlatano”, the term for “a quack”. In French, one can see “étoiles” (stars) in the “ciel” (sky). A male turkey is called a “tom”, taking its name from a “tomcat”. The inference is that like a tomcat, the male turkey is relatively wild and undomesticated, sexually promiscuous and frequently gets into fights. A female turkey is called a “hen”. The Oxford English Dictionary (OED) is a great source for a synonym (syn.) or an etymology (etym.) of any particular word. 35. Pet store cry : MEOW! 4. Teacher’s “Shh!” : NO TALKING! 33. “Bark, Bowser!” : SPEAK!